When editing a viewport, three options are available: you can edit the source design layer, the viewport annotations, or the viewport crop. 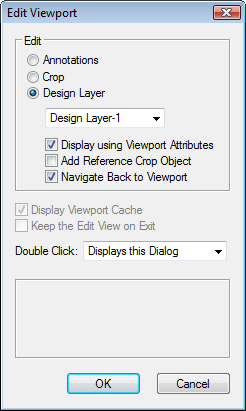 In previous versions of Vectorworks, double-clicking on a viewport always displayed the Edit Viewport dialog box. 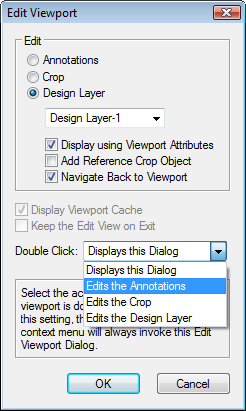 For example, if you would like to bypass the Edit Viewport dialog box and go directly into Edit Annotation mode, you can set the double-click function to do so by selecting Edits the Annotations from the Double Click drop-down list in the Edit Viewport dialog box. You can assign the double-click behavior similarly for editing the crop or design layer. 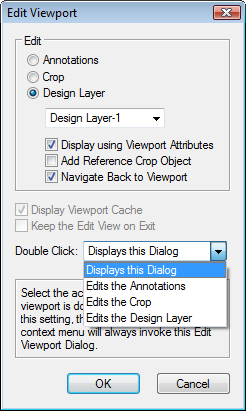 To display the Edit Viewport window, select Displays this Dialog from the drop-down list.